HOME > 大石茶園便り > 新着情報 > 朝は一杯の緑茶から始まる、すっきりな一日を！Start a brand new day with a cup of Green Tea! 朝は一杯の緑茶から始まる、すっきりな一日を！Start a brand new day with a cup of Green Tea! Start a brand new day with a cup of Green Tea! Brewing delicious tea for everybody surrounded. 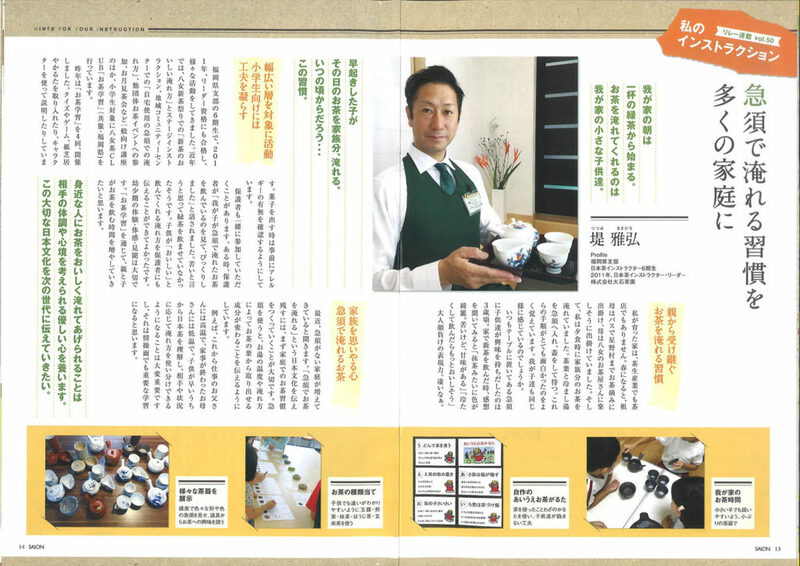 Masahiro Tsutsumi, sales manager at Oishi Tea Factory, who not only received the certification of Japanese tea instructor, but acquired the qualification of Japanese tea instructor leader. In order to convey Japanese tea culture to next generation, making a habit of brewing tea (with traditional teapot) at home is the next step to go. Through the events of "How to make delicious tea at home", Brewing delicious tea with new tea", "Japanese Tea learning" of Yame tea club for elementary school students, Mr. Tsutsumi tried his best to deliver the beauty of Japanese tea culture to all, and wish more people to value this inherited culture and perpetuate it.